February! Can you even believe it? Feels like not that long ago we were gathering up scraps of wrapping paper, listening to one last round of “Jingle Bell Rock,” and licking up all the remaining crumbs from our cookie baking party. Sorry, January– I’m glad to see you go. Let’s get on with the 2017 show! So far this year has been, well, craziness, especially if you live in the United States. I think it’s safe to say this month is a good way to start spreading more love, don’t you? In our house, love is spelled many different ways. One of those ways is B-I-S-C-O-T-T-I. And I say this with complete seriousness, because I can tell you for a fact that I had exactly ONE of these cookies during taste testing. ONE. That means that my husband had 11. Also, please see my extensive biscotti collection. We really like biscotti. I’ve said it once and I’ll say it again: if I could make this blog just about biscotti, I would. But I have to keep it fresh! Anyway, I really do love creating seasonal biscotti recipes. I have done a pistachio white chocolate chip one for St. Patrick’s Day, and gingerbread and also chocolate peppermint ones for Christmas. Also, don’t miss my funfetti version for, well, really anything celebratory. Plus: SPRINKLES!! 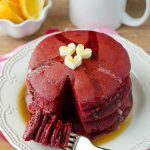 While I have used red food coloring in the past to make red velvet treats (see baked red velvet donuts and red velvet crinkle blossoms), sometimes the easier and less messy route is to use red velvet cake mix. 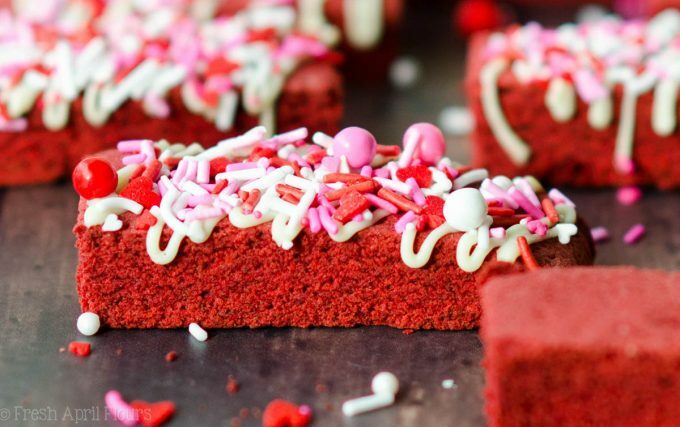 Last year, my red velvet cake mix made its way into Rice Krispies treats and also pancakes. 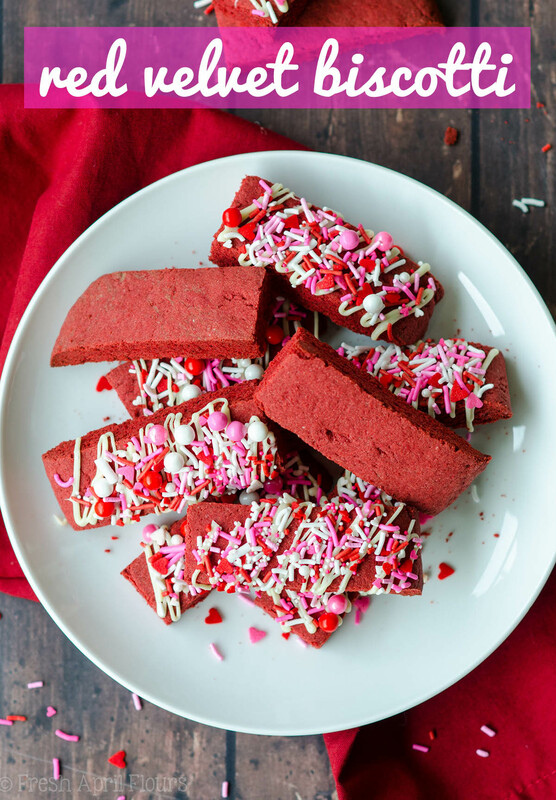 This year, I’m using it to jazz up my biscotti, and who knows– perhaps something else will spark my fancy and wind up on the blog before Valentine’s Day. Although, don’t count on that too hard, because: BABY. I’m using my general biscotti recipe as a guideline for today’s recipe, but since we’re working with cake mix, I needed a few tweaks to make it work just right. 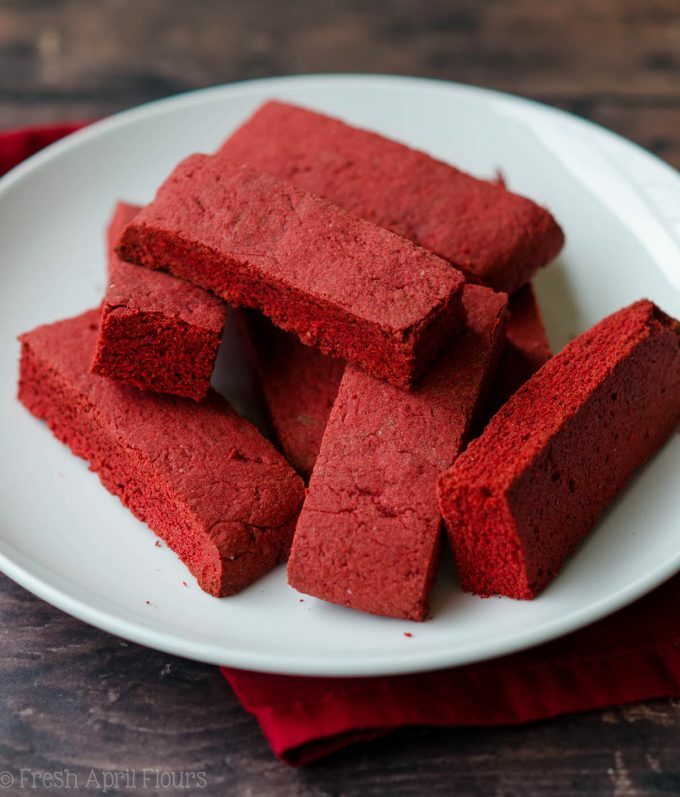 First, we’re not adding any additional sugar because 1) the cake mix is already sweetened 2) red velvet is a considerably less sweet flavor of baked goods and 3) if you’re dressing up your biscotti with white chocolate (or, any chocolate for that matter), you’ll want to reserve the sweet spot for that. A too-sweet cookie can just ruin things. Aside from the red velvet cake mix, you likely have all the rest of the ingredients in your pantry to make these biscotti. You really have no excuse not to make them. For extensive instructional photos, see my funfetti biscotti as a guide. 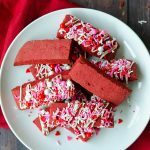 What you’re going to love about these Valentine’s Day inspired cookies is that they make the perfect little treat to go with your coffee or tea. They’re not so sweet that you have to consider them dessert, which totally makes them acceptable as breakfast items. 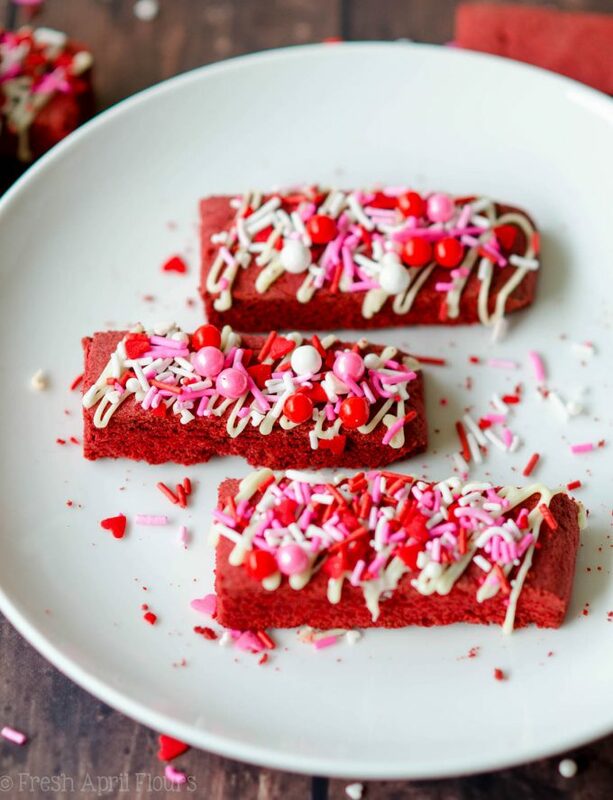 Their rich red color is the prefect canvas for some pink heart sprinkles, and while you’re at it, go wild and change up the chocolate drizzle. A dark or milk chocolate drizzle would work wonderfully here too. 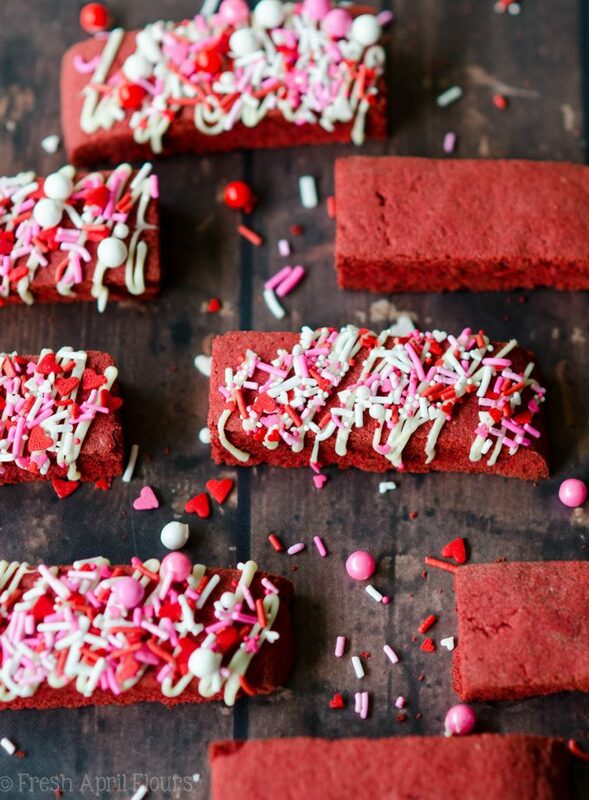 Whatever you do with your biscotti, you’re most certainly required to share them with your sweetie. The number of biscotti you’d like to share is up to you. But please, don’t let my husband guide you in this decision– share more than 1! Your sweetie will know how much you love him/her after one bite! 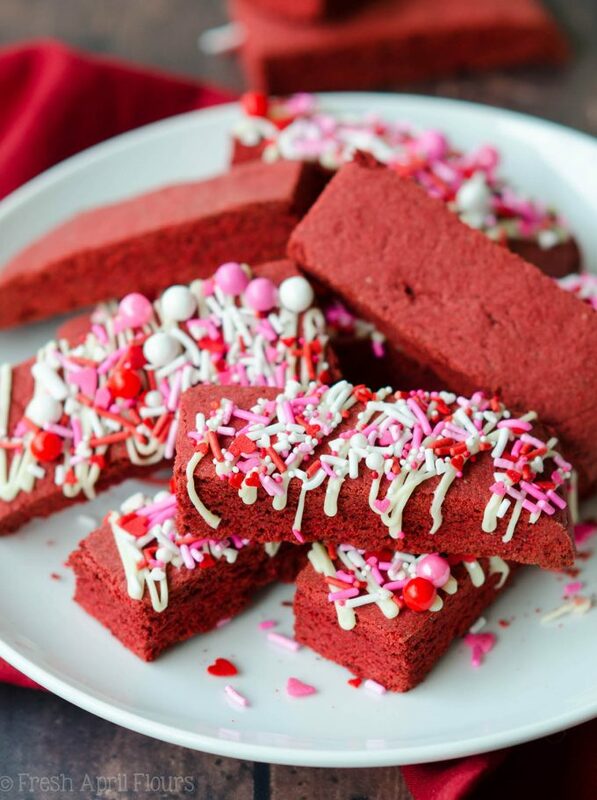 A Valentine's Day twist on classic biscotti using red velvet cake mix. In a medium size bowl, whisk together butter, oil, egg, and vanilla until combined. Set aside. 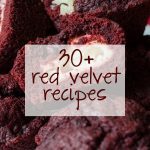 In a large bowl, toss together the red velvet cake mix, flour, and salt. Add the wet ingredients to the dry ingredients and gently mix with a large wooden spoon or sturdy rubber spatula until everything is combined. Turn dough out onto lightly floured baking sheet and, with floured hands, pat dough into a rectangle about ½" thick. My rectangle was 6" wide and 7 and ½" long (using a ruler or a ruled silicone baking mat is helpful here). Brush entire slab (top and sides) with egg wash, if using. Bake dough slab for 18 minutes, or until the slab looks set. Remove from the oven, but do not turn off the heat. Place baking sheet on a wire rack and allow to cool for 10 minutes. Once the dough is cool enough to touch, cut into 1" thick slices using a sharp knife. Cut these 1" slices in half, making a perpendicular slice down the entire slab. Set slices cut sides up on the baking sheet. Return to the oven to bake for 6 minutes. Remove from oven, turn biscotti over, and bake the other side for 6 minutes. Remove from the oven and allow to cool for 3 minutes on the baking sheet (cookies will become crunchy as they cool). Transfer biscotti to a wire rack to cool completely before serving. Decorate with white, milk, or dark chocolate and sprinkles, if desired. You can also leave them plain or give a simple dusting of powdered sugar. Biscotti stay fresh in an airtight container up to 2 weeks. Baked biscotti may be frozen up to 3 months. I can understand Matt not wanting to share more than one of these – they look and sound delicious! I love how easy you have made these by using a cake mix! I would never have thought you could use a cake mix to bake biscotti! You are a genius Lynn!